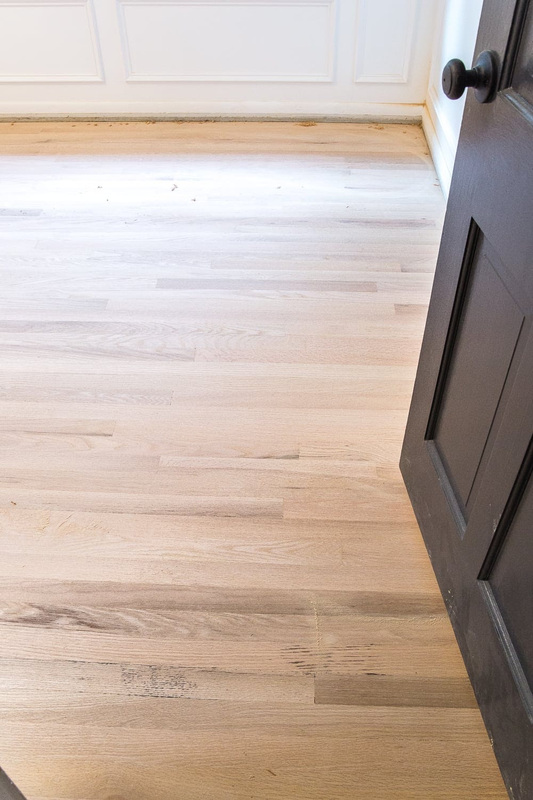 A step-by-step tutorial for refinishing an existing hardwood floor, including a complete list of materials and tips for a seamless process. This post is sponsored by Minwax. Ever since we moved into this house last year, I couldn’t WAIT for when I could go all #demoday on this bedroom. 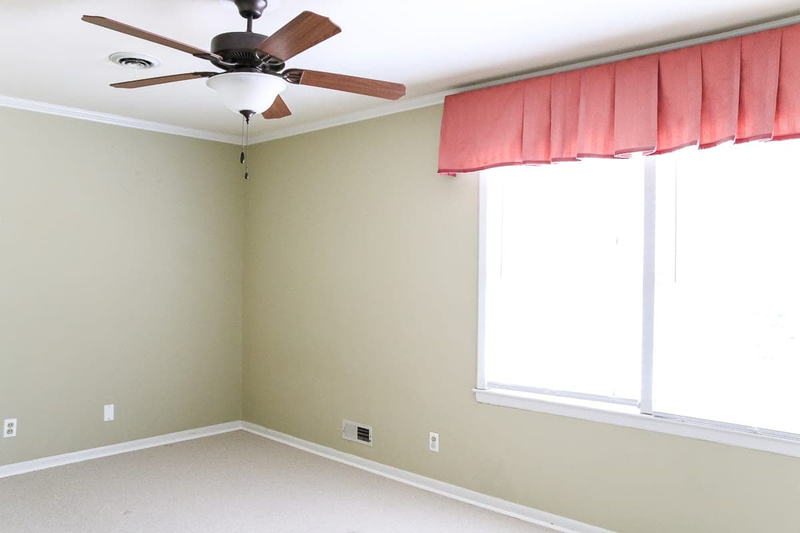 Rip down the valance, paint those greenish walls, pull out the ceiling fan, the whole nine yards. But the one thing that excited me the most was ripping up this carpet just to see if my gut feeling was correct. 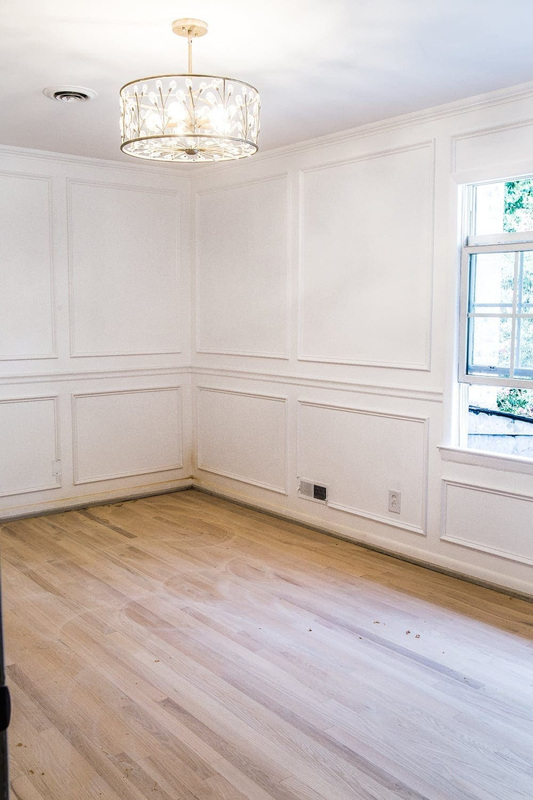 There HAD to be hardwood floors underneath, right? I mean, that’s how all happily ever afters in home renovations start. Robert pulled up a corner of the old carpet, and we held our breath just hoping and crossing our fingers. Lo and behold, we. were. right! The number one priority once we started embarking on our nursery makeover journey was dealing with this floor. And since we were knocking out this big job in my third trimester when I can’t do any hard labor or be around fumes, we knew we had to call in the pros for this one. 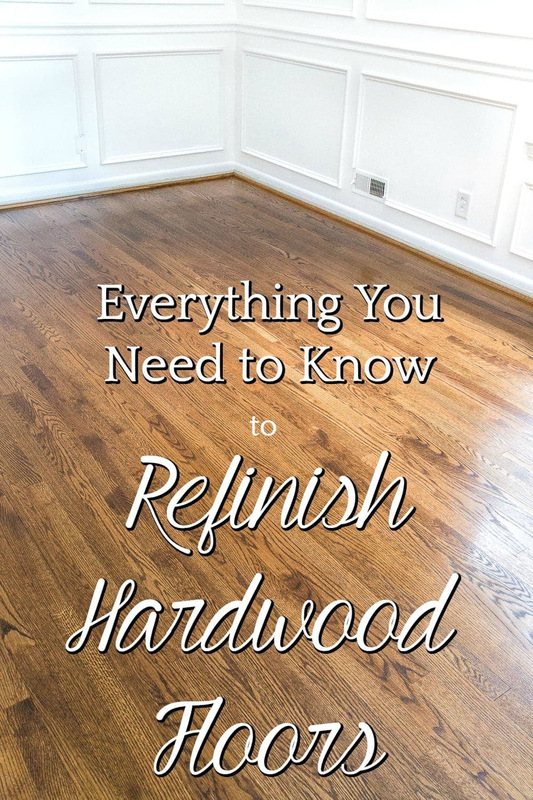 So if any of y’all are planning to go through the same hardwood refinishing process in the near future, I thought I’d share all of the details and materials we used to help yours go smoothly. But first… Exhibit A. The original state of our floors. Those lovely black spots aren’t mold, if that’s what you’re thinking. They’re just remnants from the old carpet pad. We handed over the job to our contractor who ripped out the old carpet and pad to see the full scope of what we were dealing with. 1. 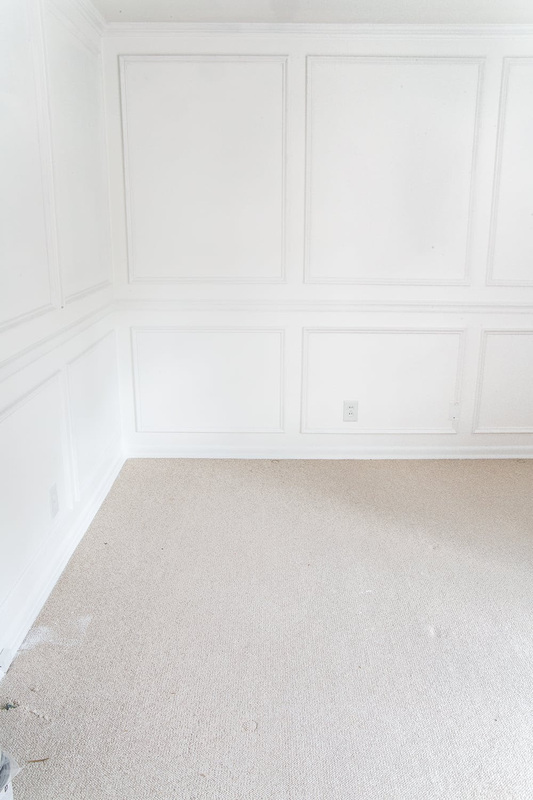 To remove the carpet, use the hammer and pry bar to remove the quarter round molding from your baseboard. Then, pull up the carpet from the corners and cut sections with a utility knife as needed. Make sure to wear safety glasses, a dust mask, and knee pads when necessary. It’s a good idea to turn off your HVAC unit, open windows, and seal off vents with plastic sheeting and painter’s tape to prevent dust from seeping into the rest of your house. 2. After you haul out the old carpet and pad, remove staples from the floor using the locking pliers. 3. 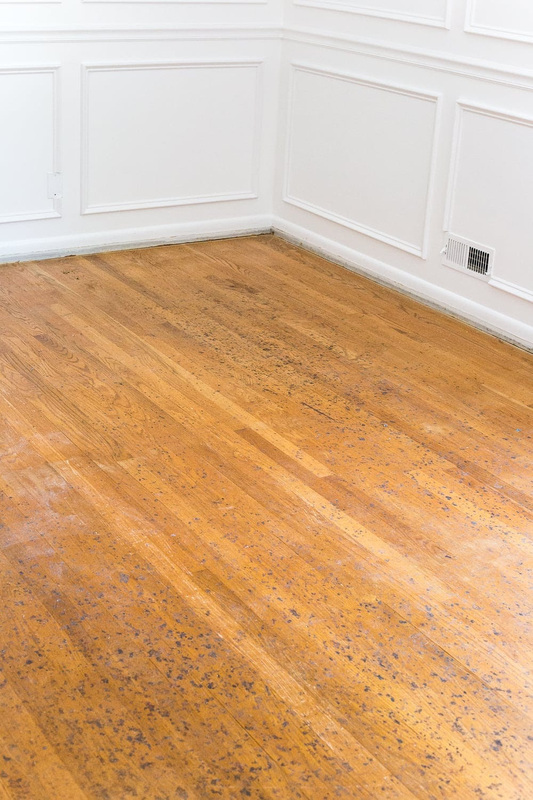 Once all of the carpet and padding was hauled away and the staples were removed, our contractor sanded around the edges and corners of the floor first with 180 grit sandpaper to remove the existing stain where the large floor sander wouldn’t be able to reach. 4. Then remove the existing stain on the rest of the hardwoods using a large floor sander. You can usually rent a floor sander for a day from your local hardware store, if you’re choosing to do the job yourself. 5. 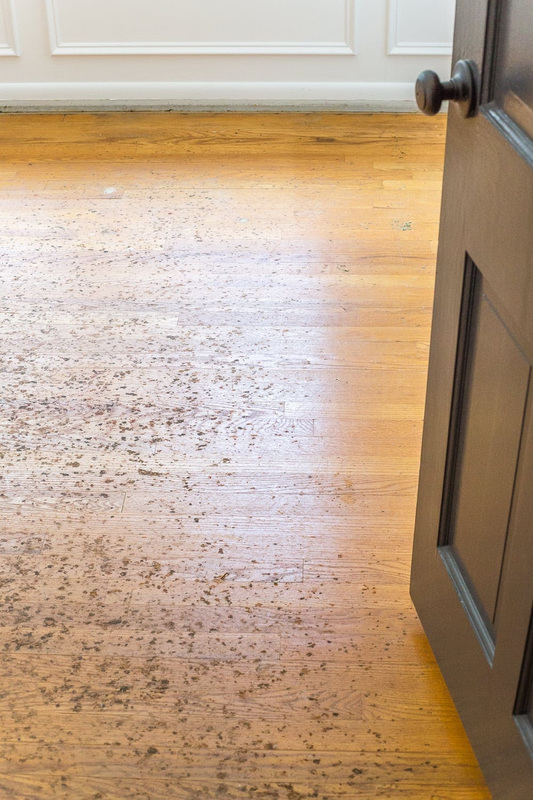 Once all of the sanding is finished, remove the sanding dust leftover on the floor using a shop vac and tack cloth. Wear a respirator mask and knee pads for this task, and start in the far corner opposite from the door in the room. 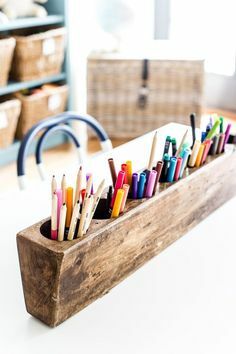 Use a Purdy lambskin staining pad to work in sections by applying the stain and wiping away the excess, always in the direction of the wood grain. Repeat the process all across the floor until you have worked your way out of the door (because nobody wants to stain Baby into a corner). Let the stain dry on the floor for at least 24 hours (hot, humid conditions may take longer). 7. When the floor is fully dry after staining, apply the sealer step. 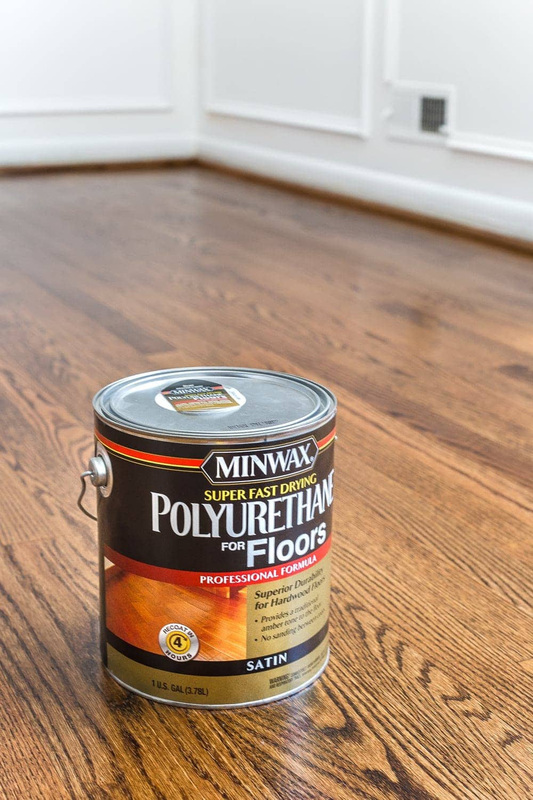 Start again with the edges/corners of the floor by applying Minwax Super Fast Drying Polyurethane for Floors using a Purdy XL 2.5″ angled brush. Make sure not to overwork the polyurethane. Just brush it on in one smooth stroke at a time. Once the edges and corners have sealer applied, start again in the far corner opposite from the door just like you did with the stain and roll on more polyurethane using a Purdy lambskin roller in a smooth, even coat. We chose a satin sheen for ours. 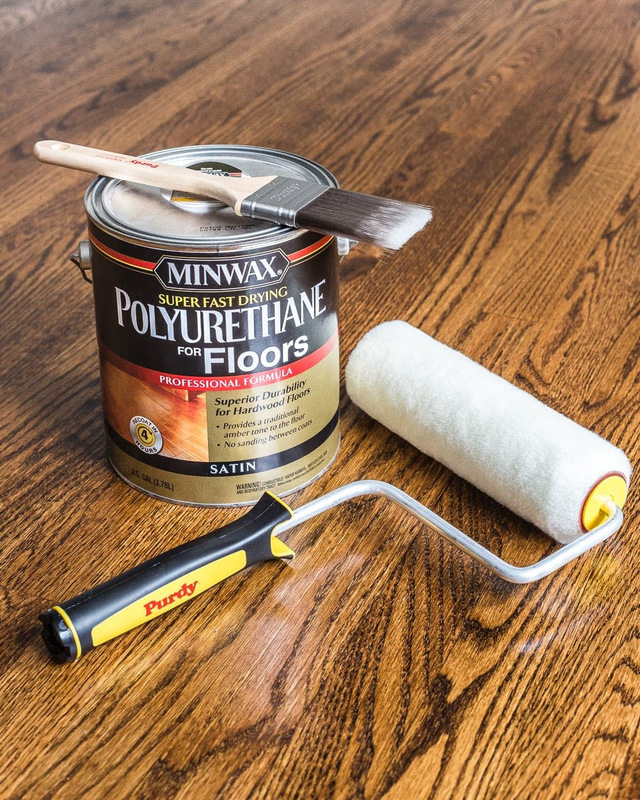 Once the polyurethane is dry (after about 4 hours), apply one more coat in the same way. 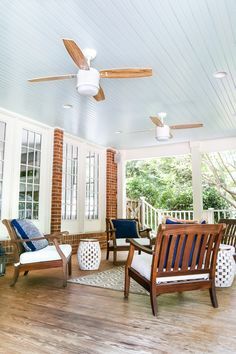 Let the sealer dry for at least 24 hours before walking on it again, and even then make sure not to drag furniture and always wear just socks or covers over your shoes to avoid any damage before it cures. 8. 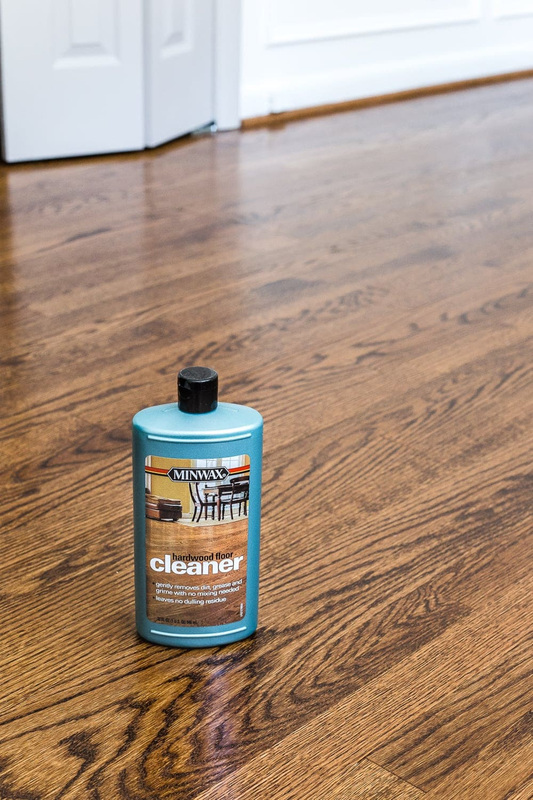 For routinely cleaning the floors, we use Minwax Hardwood Floor Cleaner. But wait at least a week after your floors have been sealed before using it. Squirt it on and mop and you’re done. I love that I don’t have to mess with a bucket and rags. 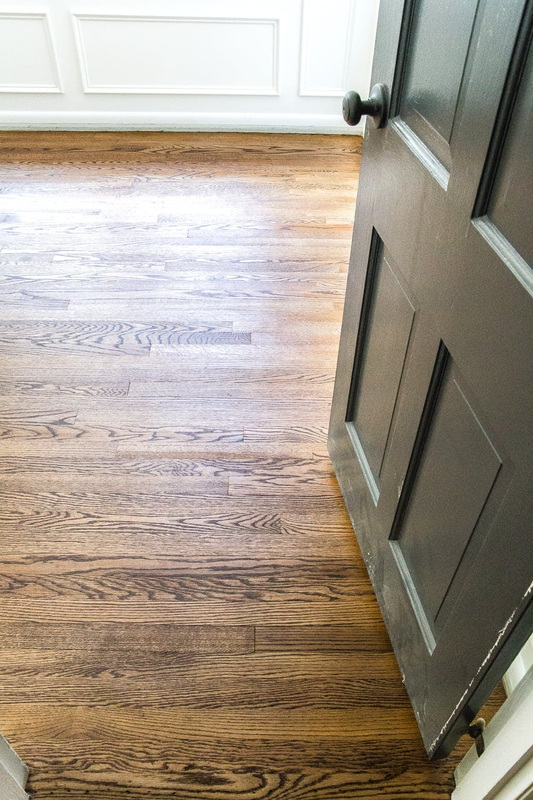 It’s definitely not a quick, simple job, but walking into this room to see this gorgeous floor gleaming in its newly refinished beauty was totally worth every bit of it. So now that this big task on the to-do list is finished, I’ll be sharing the entire nursery reveal next week! Eek! Now that this nursery floor is finished, we still have Robert’s office left as the only carpeted room in the house. And I’m betting my bottom dollar there are hardwoods hiding underneath just begging to see the light of day too. Since I won’t be pregnant when we give that space a big makeover, I’m really tempted to do that one ourselves. But it was a great lesson to see how the pros handle it this time around. Gorgeous floors. Well worth it! This post came at the perfect time! We’re going to be re-finishing the original 2″ pine floors in our remodel in the next few weeks. Ours were tucked away under 20 year old carpet and were in great condition too, we just don’t like the orange-y stain. Thanks for all the tips! Yaaay! So glad it might help, Ashley! We were in the same boat with that orange-y stain from before. That’s great news that they’re in such good condition! If you’re doing it yourself, careful staining pine – it doesn’t accept stain very well due to the sappy nature of the wood. The darker you stain, the more splotchy it will look. 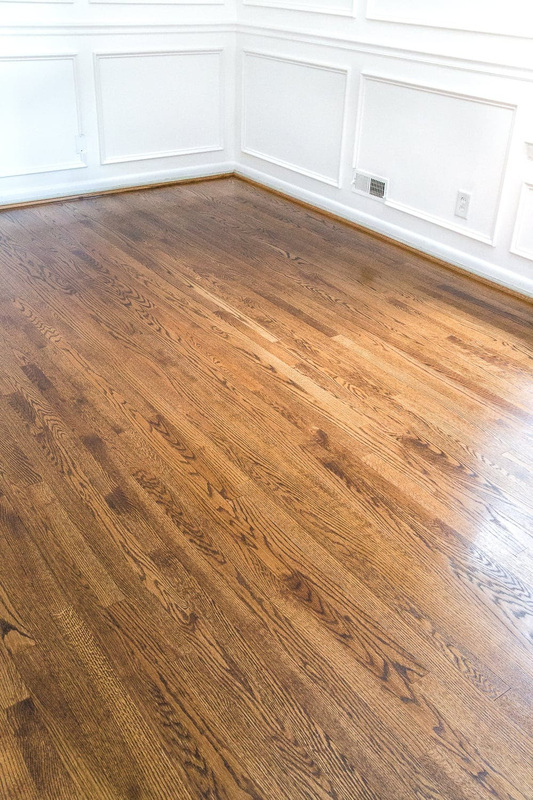 Stay more in the natural tones of stain and look up “water popping”, that helps with the uniformity of the stain color. Great insight!! Thank you, Colby! Thank you! The whole reveal will be out soon! It’s nice for a do it yourselfers. As a professional who knows , one cannot rent such equipment to stand a floor to my clients expectations. I see sand scratches still left from the sander and inconsistencies in the sanding and staining process. 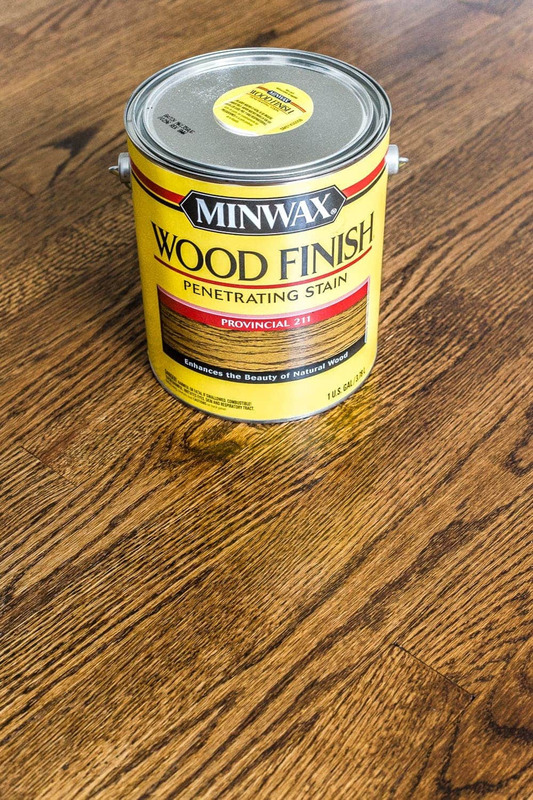 While you can RIP off the old finish, it is much more the art to remove “ALL” scratches and a level and consistent stain. I take my hat off to those that think they can take this task on, but that is why we have an industry ! Your floor turned out beautifully, love the color! Thanks, Terry! We couldn’t be happier with the end result! From a cost perspective, is there a reason why you waited to do the office? Like is it a cost per square foot or does the cost per square foot go down the more space you add? We waited mainly just because we didn’t want to take on too much at one time, and we knew we were already in a time crunch trying to refinish these floors so close to our baby’s due date. The nurser floor is absolutely beautiful! Thank you for sharing the process- and I love your stain color pick. Wow Lauren they look fantastic and take the room up to another level altogether. Looking forward to the reveal and more importantly the arrival of the little occupant. I have tried to contact you on several occasions to let you know that I am no longer getting your posts. I subscribed and received your posts for quite some time and then they stopped. I love your blog posts and it’s a pain to have to go to the internet to get them. Please let me know if there is a problem as to why I no longer receive your posts. I still follow you on instagram but it’s not enough.? Thank you so much for your help. Oh wow, Amazing work Lauren! I’m surely going to implement these tips. Love it. Really helpful. We must take care of our wood floors by doing this. It really beautifies your home. Thanks Lauren for sharing! That’s exactly what your project made me think of! You took a piece of history and brought it back! AWESOME!! I wish everyone could see and appreciate the beauty in hardwood flooring. They look fantastic! Awesome article! Hello! Sorry I cant find the main comment box so decided to piggyback onto thisthread. Did you have to fill any gaps in between the planks? If so,what technique or product(s) did you use? And lastly, we are holding off on the project due to a concern that it would have a strong lingering wood stain smell fill our home for weeks similar to freshly stained furniture. Is this a problem with floor stain or did you find a way to remedy that? Thanks SO much!!! Hi, Jannelle. We are lucky that we did not have to fill any gaps in the planks. The floors were in great shape. We had a professional company do our floors due to pregnancy just for the reason of fumes. We stayed at my parents house the weekend that the floors were remade. 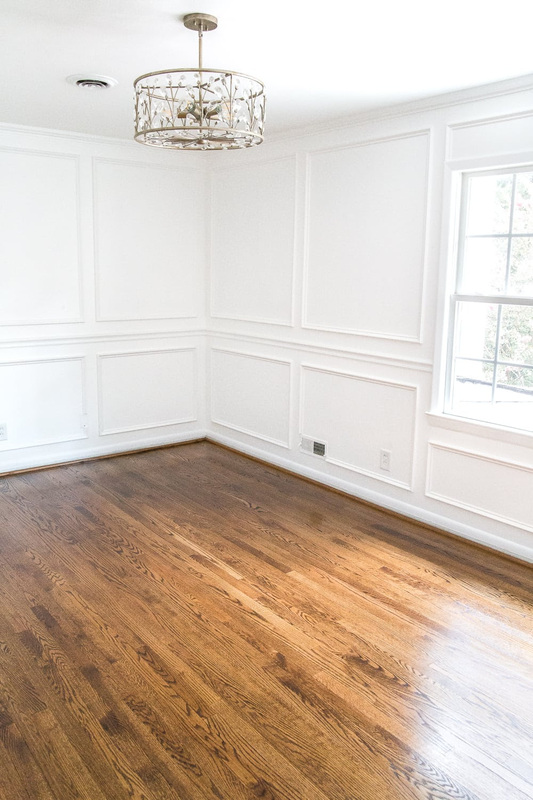 The hardwood floors that you did look amazing at the end. 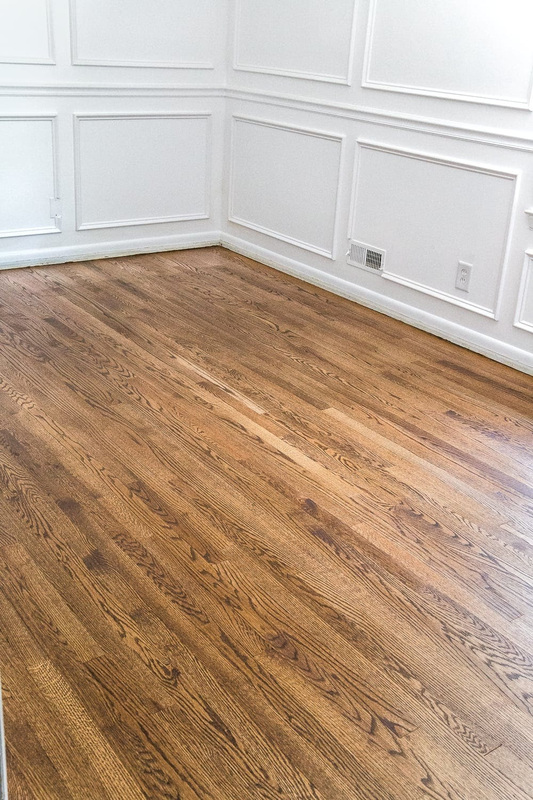 My wife and I are planning on doing a similar hardwood refinishing project and hope that ours looks as good. One problem we have is keeping our kids out of the room so that the stain could dry. Hi there! Thanks for sharing. Through working at Ironmongery Experts, I have dealt with many hardwood floors over the years. 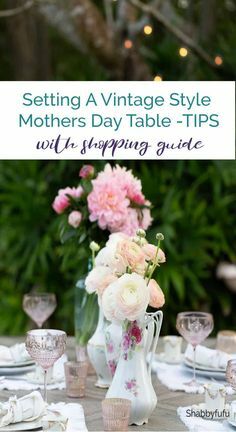 You give some great tips that I will consider using in the future! Ryan, at Ironmongery Experts. I’m wanting to refinish my floors here soon. I don’t have much of an idea what to do as I haven’t before. I should probably get professional help for something like this.